The best way to get started with OpTiMSoC after you’ve prepared your system as described in the previous chapter is to follow some of our tutorials. They are written with two goals in mind: to introduce some of the basic concepts and nomenclature of manycore SoC, and to show you how those are implemented and can be used in OpTiMSoC. Some of the tutorials (especially the first ones) build on top of each other, so it’s recommended to do them in order. Simply stop if you think you know enough to implement your own ideas! It is a good starting point to simulate a single compute tile of a distributed memory system. Therefore a simple example is included and demonstrates the general simulation approach and gives an insight in the software building process. Simulating only a single compute tile is essentially an OpenRISC core plus memory and the network adapter, where all I/O of the network adapter is not functional in this test case. It can therefore only be used to simulate local software. You can find this example in $OPTIMSOC/examples/sim/compute_tile. You will then find the executable elf file as hello/hello.elf. Furthermore some other files are built. They are essentially transformed versions of the ELF file, i.e. the software binary. Congratulations, you’ve ran your first OpTiMSoC system! If you are already familiar with embedded systems or microcontrollers, you might wonder: how did the printf() output from the software get into the stdout.000 file if there is no UART or anything similar? OpTiMSoC software makes excessive use of a useful part of the OpenRISC ISA. The “no operation” instruction l.nop has a parameter K in assembly. This can be used for simulation purposes. It can be used for instrumentation, tracing or special purposes as writing characters with minimal intrusion or simulation termination. The termination is forced with l.nop 0x1. The instruction is observed and a trace monitor terminates when it was observed at all cores (shortly after main() returned). This function is called from printf as write function. The trace monitor captures theses characters and puts them to the stdout file. One major benefit of simulating a SoC is the possibility to inspect every signal inside the hardware design quite easily. When running a Verilator simulation, as we did in the previous step, you can simply add the --vcd command line option. It instructs Verilator to write all signals into a file. You can then start a waveform viewer, like GTKWave to display it. This command will run the hello world example like it did before, but this time Verilator additionally writes a sim.vcd waveform file. You can now view this file. The screenshot is similar to what you should see when running GTKWave. On the left side you find a hierarchy of all signals in the system. Add them to the wave view and explore all internals of a working SoC at your fingertips! Can you find the program counter? The instruction and data caches? The branch predictor? Next you might want to build an actual multicore system. In a first step, you can just start simulations of compute tiles with multiple cores. Inside $OPTIMSOC/examples/sim/compute_tile you’ll find a dual-core version and a quad-core version of the system with just one compute tile that you just simulated in the previous step. You can run those examples like you did before. The first thing you observe: the simulation runs become longer. After each run, inspect the stdout. * files. Welcome to the multicore world! Next we want to run an actual NoC-based tiled multicore system-on-chip, with the examples you get system_2x2_cccc. The nomenclature in all pre-packed systems first denotes the dimensions and then the instantiated tiles, here cccc as four compute tiles. In our pre-built example, each compute tile has two CPU cores, meaning you have eight CPU cores in total. optimsoc_get_ctrank(): Get the rank of this compute tile in this system. Essentially this is just a number that uniquely identifies a compute tile. There are more useful utility functions like those available, find them in the file $OPTIMSOC/soc/sw/include/baremetal/optimsoc-baremetal.h. A simple application that uses those functions to do message passing between the different tiles is hello_mpsimple. This program uses the simple message passing facilities of the network adapter to send messages. All cores send a message to core 0. If all messages have been received, core 0 prints a message “Received all messages. Hello World!”. Have a look what the software does (you find the code in hello_mpsimple.c). Let’s first check the output of core 0. [               48734, 0] Received all messages. Hello World! Finally, let’s have a quick glance at a more realistic application: heat_mpsimple. You can find it in the same place as the previous applications, hello and hello_mpsimple. The application calculates the heat distribution in a distributed manner. The cores coordinate their boundary regions by sending messages around. Can you compile this application and run it? Don’t get nervous, the simulation can take a couple of minutes to finish. Have a look at the source code and try to understand what’s going on. Also have a look at the stdout log files. Core 0 will also print the complete heat distribution at the end. Up to now, you have seen the output of the software that runs on your SoC. And you had a look deep into the inner works of the SoC by looking at the waveforms. In a real-world system, you need something in between: a way to observe the software as it executes on a chip, but without observing or understanding all the signals inside the hardware. This is what the debug system provides: hardware inside the chip which allows you to observe what’s going on during software execution. OpTiMSoC also comes with an extensive debug system. In this section, we’ll have a look at this system, how it works and how you can use it to debug your applications. But before diving into the details, we’ll have a short discussion of the basics which are necessary to understand the system. Many developers know debugging from their daily work. Most of the time it involves running a program inside a debugger like GDB or Microsoft Visual Studio, setting a breakpoint at the right line of code, and stepping through the program from there on, running one instruction (or one line of code) at a time. This technique is what we call run-control debugging. While it works great for single-threaded programs, it cannot easily be applied to debugging parallel software running on possibly heterogeneous many-core SoC. Instead, the debug support in OpTiMSoC mainly relies on tracing. Tracing does not stop or otherwise influence the SoC itself; it only “records” what’s going on during software execution, and transmits this data to the developer. The debug system consists of two main parts: the hardware part runs on the OpTiMSoC system itself and collects all data. The other part runs on a developer’s PC (often also called host PC) and controls the debugging process and displays the collected data. After this introduction, let’s make use of the debug system to obtain various traces. Just like in the previous examples, our SoC hardware is still running in Verilator. This tutorial works best if you have multiple terminal windows open at the same time, as we’ll need to have multiple programs running at the same time. So, open a new terminal (or a new tab inside your terminal), and start the simulation of the SoC hardware. Just like in the previous examples you can see the output of the program runs as captured by the simulation software in the files stdout.NNN in the directory where you started the simulation. 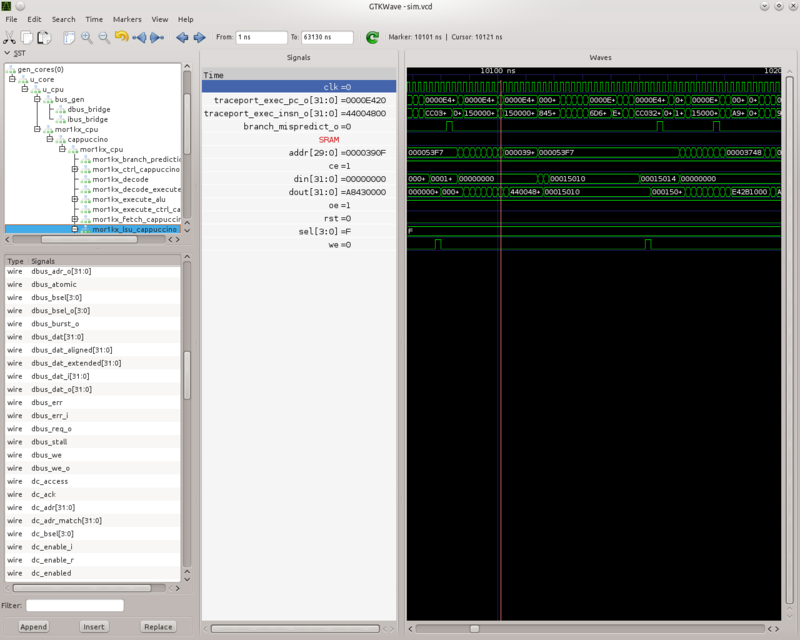 Reading the stdout files works great as long as OpTiMSoC runs in simulation – but how can you access the program’s output when it runs on an FPGA? The answer is called “system trace”, and you’ll learn more about that in the next section. Just like before, osd-target-run initializes the memories and starts the CPUs. It then starts recording system traces until you press CTRL-C to end the trace collection. (Yes, you need to abort the program by pressing CTRL-C! It will not terminate itself.) After roughly 20 seconds, you can press CTRL-C to stop collecting traces. Now you can analyze the collected traces in the same directory you ran osd-target-run in. The files systrace.print.NNNN.log contain the printf() output of the program. These files are generated by analyzing the raw system log events, which are recorded in systrace.NNNN.log. If you need more insight into a program than system traces provide, or want to get insight into a program which isn’t instrumented to generate system traces, core function traces come to help. These traces are recording every call of a function and every return from it, resulting in traces which allow you to understand which parts of your program have been called. Just like in the previous example, you need to stop the trace collection by pressing CTRL-C. You can then view the traces in the coretrace.NNNN.log files. This completes our short trip through the debug system. Knowing about it will be of great help when we move on to the next step: running OpTiMSoC on an FPGA. Welcome to the fun of real hardware! Before we can get started, you need to clarify some prerequisites. This, of course, first means that you need borrow, buy or otherwise obtain an FPGA board. In this tutorial, we use the Nexys 4 DDR board by Xilinx/Digilent. It’s not that expensive (of course, depending on your financial situation) and widely available. If you need help obtaining one, let us know - maybe we can help out in some way. Additionally you need to download and install the Xilinx Vivado tool (the cost-free WebPack license is sufficient). We used the 2016.4 version when preparing this tutorial; we strongly recommend you also use this exact version. Once you have obtained the FPGA board, connect it to the PC on the “PROG UART” USB connection. You don’t need to connect any additional power supply. With the board connected, we can program (or “flash”) the FPGA with our hardware design, the bitstream. The OpTiMSoC release contains pre-built bitstreams for the single compute tile system, meaning we can start directly with programming the FPGA. There are two ways to program the device: using the Vivado GUI, or using the command line. Ensure that your Nexys 4 DDR board is plugged into your PC and is turned on. Now click on “Program Device” in the same green bar and select the only option xc7a100t_0 (that’s the FPGA on the board). You can leave the other field “Debug probes file” empty. Click on “Program” to download the bitstream onto the FPGA. After a couple of seconds, your FPGA contains the SoC hardware and is ready to be used. In the previous tutorials, we have already seen the debug infrastructure and connected to it over TCP. We now use the same tools to connect to our SoC, but this time we connect to the FPGA using UART. Fortunately, you don’t need to connect any additional cables; the USB cable that you just used to program the FPGA is also the serial connection. If you have only the Nexys 4 DDR board connected, you’ll see only one device, e.g. /dev/ttyUSB1. Make note of this device name, and replace it accordingly in all the following steps in this tutorial. Now that you’ve connected to the system, can you run software on it? Just like in the previous chapter we’ll use the osd-target-run tool, this time passing it some paramters to connect to the FPGA instead to a simulation. When you run software, you’ll notice two things: first, the output is the same as you’ve already seen when running the system in simulation. But: it’s much faster. The FPGA runs at 50 MHz, which is still quite slow compared to current desktop processors, but still much faster than the simulation. Before we end, let’s discuss one more topic which helps you in writing good software for OpTiMSoC: message passing. So far the example programs you have seen used the low level message passing buffers to exchange data between the tiles. You may remember that exchanging this data involved forming and parsing messages including the low level network-on-chip details. To abstract from these low level details and to encapsulate certain extensions OpTiMSoC comes with the message passing library (libmp). It is a rather simple, straight-forward message passing API. Two different styles of communication are supported: message-oriented and connection-oriented. Message-oriented communication is preferred when you have spurious communication between many different communication partners. Connection-oriented communication is preferred when you have a fixed setup of channels between communication partners. In this part of the tutorial you will learn the basic usage of the message passing library using message-oriented communication. In the baremetal-apps you can find the hello_mp example. Inspecting hello_mp.c you can see that it is much less code than the low level example from before. The parameters of those functions can be ignored for now. After calling those functions you can use the message passing library. optimsoc_mp_endpoint_handle is the opaque type used to identify an endpoint in your code. You create and initialize the endpoint by calling optimsoc_mp_endpoint_create() that takes a reference to this handle as first parameter. The second and third parameter initialize the endpoint with a node and port. Each endpoint is globally addressable with its (tile, node, port) identifier. In our case the node 0 and port 0 endpoint is created in each tile. The remaining parameters of optimsoc_mp_endpoint_create() configure the endpoint. By using OPTIMSOC_MP_EP_CONNECTIONLESS we create it to receive messages from arbitrary tiles. The last two parameters configure the number of messages it can hold and the maximum message size (0 says it is the default). So what they do is to define a second endpoint. But in this case it is not locally generated but points to a remote endpoint. It is the one we want to send a message too: tile 0, node 0, port 0. What happens under the hood it blocks until the remote endpoint is created and ready and than stores some information locally. In the final step the software sends a word to the remote endpoint using the local endpoint for sending. Up to now all software running on OpTiMSoC was “baremetal” software, similar to software run on a microcontroller. For many purposes “baremetal” software is sufficient. However, if you want to write more advanced software an operating system (OS) can help: it provides task management (scheduling), separates resources between tasks, and provides standardized interfaces which are expected by many of today’s applications (e.g. pthreads). For many, the operating system of choice is Linux, and it’s natively supported by OpTiMSoC. This tutorial section explores how to build a Linux “image,”. i.e. a binary which contains both the Linux kernel (the actual operating system), together with a root filesystem containing all userspace components. This leaves a file output/images/vmlinux in the buildroot directory, which is in fact a regular ELF file for OpenRISC, which can be loaded on the system like a baremetal application. To see the output of the Linux during boot, and to have a console to interact with the Linux system we make use of the UART device emulation provided by Open SoC Debug, and built into the compute_tile designs. To continue with this tutorial we use the compute_tile design with a with a single core and the debug system for the Nexys 4 DDR board. You can find this design in the folder $OPTIMSOC/examples/fpga/nexys4ddr/compute_tile/compute_tile_nexys4ddr_singlecore. Now you can load the Linux image on the FPGA. See notes earlier in this tutorial for a discussion on the correct parameters for osd-target-run. Watch the output of this command. If all goes well the output should contain a line similar to libosd: DEM-UART pseudo-terminal available at /dev/pts/19. Keep note of the device file (starting with /dev/pts/), you’ll need this path to connect to the Linux console on the OpTiMSoC system. You should now see the output of Linux booting, and as soon as the boot process is done you can log into the system as root user (no password is required). You can now interact with the system as it would be a normal Linux system. If you have some time to spare, how about playing a round of pacman? This concludes our tutorial session, and hands over to you: modify the software as you wish, program it again, analyze the simulations and explore your first multicore SoC.